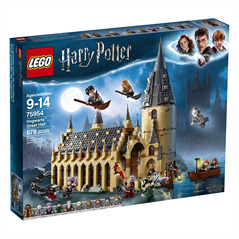 The huge Hogwart's Great Hall Harry Potter set #75954 comes with 878 pieces including, the great dining hall with reversible house banners, a secret spiral staircase to the tower, potions room, and treasure room. 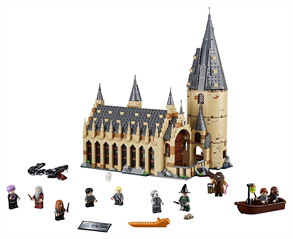 Then get ready to hold onto your sorting hats because the set comes with 10 mini figures! There's Hagrid, Nearly Headless Nick, Professor Quirell, Professor McGonagall, Dumbledore, Draco, Harry, Susan Bones, Hermoine, and Ron Weasly. Of course, there's the sorting hat, and as an added surprise there's the Mirror of Erised with 4 reflective panels for revealing the heart's desire. There's even Hedwig and Scabbers and lots of other magical accessories. This set takes 2 hours to complete. LEGO nails it once again! The Harry Potter Hogwart's Great Hall set allows kids to recreate the magical realm from the Harry Potter films with this beautifully detailed 4-level castle. 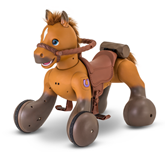 With so much Potter detail, this fantasy role-playing toy will engage Potter fans in 2 hours of building fun. Let's not forget it comes with a staggering 10 mini figures! 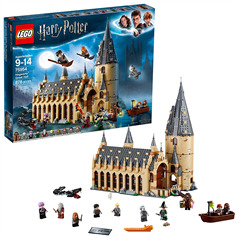 Even though this set is said to be designed for ages 9 to 14, Harry Potter fans of all ages will love these sets. The Hogwart's Great Hall is a masterpiece and LEGO lovers will appreciate the detail. Excellent addition to any LEGO lovers collections. LEGO Harry Potter Hogwart's Great Hall Harry Potter set takes about 2 hours to complete. 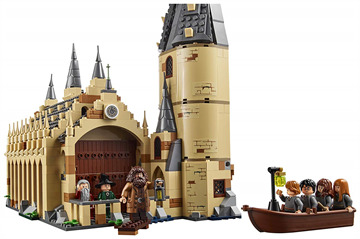 The LEGO Harry Potter Hogwart's Great Hall Building Set is perfectly designed for the Harry Potter lover! And the fact that is comes with 10 mini-figures means endless open play to create and recreate Harry Potter magic.